Boulder has a strong contender to reverse the seeming jinx of the Riverside Building that hovers over Boulder Creek on Broadway. Per La Gente is an amazing new restaurant that is an awesome combination of fine dining and Boulder casual and has everything it needs to be successful. The restaurant was started by a team of four individuals who relocated to Boulder from The Little Nell in Aspen, one of Colorado’s premier five-star resorts. Headed by Chef Lewis Guarasci and general manager Charese Borgerson, this small group puts out wonderful food at a reasonable price. Most importantly, their hearts are in the right place and they are willing to work as hard as needed to please their customer. Chef Guarasci is as entertaining as he is talented; this article is sprinkled with his quotes. Trained with a three-year apprenticeship at the Broadmoor (another five-star Colorado resort), Guarasci is very open about his roots “growing up with social services”. Hence the name of the restaurant (Per La Gente or For the People) and many of his policies. The restaurant will pool and share tips, everyone works at doing whatever is needed, and he is very selective about hiring the few assistants he has working. Chef Guarasci explaining his food and his credo. Guarasci proudly tells diners about his “Georgian roots, Colorado upbringing, and Italian heritage”. All three of these locations have an influence on his menu but it is perhaps his Italian grandmother who had the greatest influence. Even the Fried Green Tomato dish (delicious) comes with a saba dressing, which is essentially un-aged balsamic vinegar. 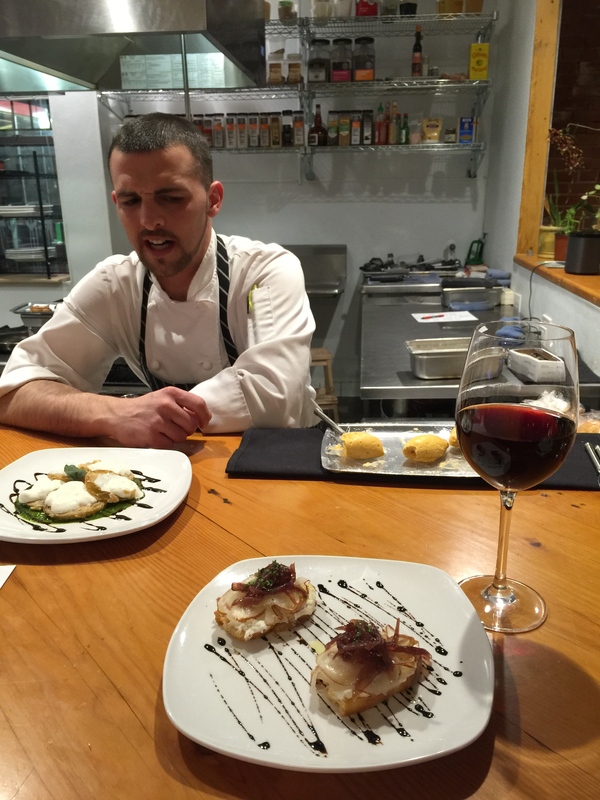 Chef Guarasci puts out amazing food, plate after plate, that will knock the socks off most Boulder diners. We’ll review our meal in a second post coming shortly. But perhaps more importantly, this restaurant has a vibe and the heart to make it fit right in with our little city. During our meal, we sat at the counter, which afforded not only an excellent look into the kitchen but also the best seat in the house to hear the tales of Chef Guarasci. At one point, he snuck away from his kitchen and his duties to slip me a piece of paper. “These are my three friends who are my teammates,” he explained when handing me the list. I couldn’t do it without them and they are the most important part of the story.” In addition to Chef Guarasci and Charese, that team includes sous chef Chris Carrillo and do-everything-man Thomas Knowles, who “traded whites for blacks” to be in charge of service instead of working in the kitchen. It is funny the Riverside building has such a bad reputation. It has the only creekside patio in Boulder, is centrally located, and has lots of space for different seating areas. The lack of parking is always the answer given as to why restaurants don’t succeed there but given Boulder’s outdoor ethic, it would seem a non-issue to park a block away and do a little walking. Per La Gente is open for breakfast, lunch, and dinner and I strongly recommend checking it out. My favorite quote from Chef Guarasci explains his goal of serving both the common man and fine diner, whom he considers one and the same. Eat Drink Boulders’ two writers were invited to visit the restaurant and their meal was comped. This article, however, is definitely their own opinions.